When it comes to creating a true vacation experience, Whistler Blackcomb has it down to a science. From being home to some of the best skiing in the world to hosting the 2010 Winter Olympic Games, one trip to Whistler is all it takes to see why it was just voted as the #1 Overall Ski Area in North America by the readers of Ski Magazine. There are a few statistics about Whistler Blackcomb that are really interesting. Did you know that…? Whistler Blackcomb is the largest ski area in North America covering over 8,100 acres? Whistler Blackcomb is 54 percent larger than Vail? Microsoft XP was codenamed “Whistler” because employees associated with its development skied at Whistler while developing the software? Whistler gets its name from the call of the hoary marmot (looks kind of like a beaver)? Whistler Blackcomb is just as much fun in the summer as in the winter? One of the best advantages of planning a vacation in Whistler Blackcomb is the lengths that the planners go to ensure the trip is one of a kind. Deals and packages are always plentiful but on top of that, they always have passes and tickets to activities and events as well as restaurants and other venues to make the trip an all-encompassing experience. It seems that more and more people are discovering Whistler Blackcomb even in the summer. In fact, according to a recent article in Pique News Magazine, “August came in as the fourth consecutive record-breaking month for room nights,” signaling that there were probably a record breaking number of visitors in the summer. And it is no wonder that so many people want to go there. The backdrop is absolutely a panoramic beauty with snow-capped mountaintops surrounding an area filled with thick green grass, tall trees and perfect temperatures. Add to that the fact that there is so much to do. Summer events happen almost every day to create, dare we say it, the ultimate vacation experience. 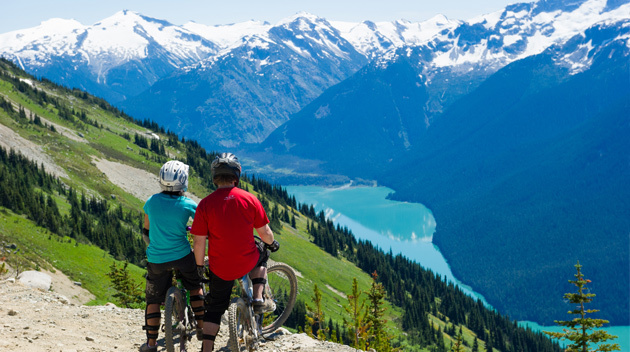 Summer vacations in Whistler include lots of hiking and biking as well as ATV tours and the number one activity at Whistler, the Peak2Peak Gondola Alpine Experience. This is the best way to see the entire Whistler area and is one of those “must-do” activities when vacationing there for the first time; however, many love to do it over and over again. It is obvious to vacation during the winter in Whistler Blackcomb. Anyone who loves cold weather outdoor activities hits nirvana in Whistler. Skiing, snowboarding, snowmobiling and every other activity are on the schedule when in Whistler. And, yes, it is OK to just enjoy being outside in the snow – dressed in the appropriate “ski-attire” to look the part. Vacations at Whistler-Blackcomb can be as action-packed or as laid back as anyone wants. There is no surprise that most people who go to Whistler once go back over and over again. Some just want to enjoy the best skiing in North America while others just like being there. With so much to do and vacation rental companies providing the total vacation experience, anyone can see why there are so many return visitors. Barefoot Technologies can help your vacation rental company provide a vacation rental experience through the use of our Tenant Access, Concierge services, coupon codes and more. For more information, please contact Claiborne at claiborne@barefoot.com or 804.212.1280.